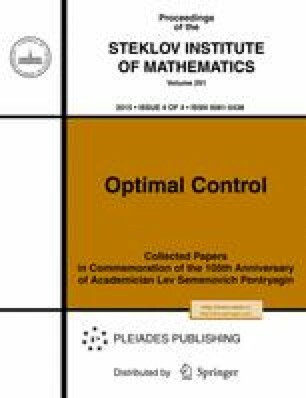 Problems of constructing and analyzing the properties of attainability domains play an important role in control theory and its applications. In particular, this applies to control under impulse constraints that reflect the energetics of a process. The situation is complicated by the possible instability of the process under variation (in particular, under relaxation) of constraints related to boundary and intermediate conditions. Stability of the problem is also missing, in general, under relaxation of state constraints. In these cases, it is natural to focus on the asymptotic variant of the statement; this is especially expedient when one has to deal with initially asymptotic requirements. In all these cases, it seems expedient to use analogs of J. Warga’s approximate solutions. At the same time, to seek necessary approximate (and, in fact, asymptotic) solutions, it is natural to use generalized modes. For problems with impulse constraints and discontinuity in the coefficients of control actions, such modes lead to phenomena described by products of discontinuous functions and generalized functions even in the class of linear systems. In a large series of his studies, to overcome the arising difficulties, one of the authors used constructions of extension in the class of finitely additive measures. The present paper follows this approach and is ideologically relevant to the engineering problem of controlling the thrust of an engine under conditions of a given program of variation of its orientation; it is postulated that energy resources are completely consumed in a natural (for a number of impulse control problems) mode of short-duration impulses: the set of time instants at which the instantaneous control is different from zero can be embedded in an interval of vanishingly small length. Within these short periods of time, the engine should consume all energy resources while obeying some other constraints (making the sense of moment constraints) to a high degree of accuracy. In addition, one should take into account the possible discontinuity of the functions defining the coefficients of control actions. As a natural analog of the attainability domain, we use an attraction set, whose construction, together with the subsequent study of its main properties, constitutes the goal of the present study. Original Russian Text © A.G. Chentsov, A.P. Baklanov, 2015, published in Trudy Matematicheskogo Instituta imeni V.A. Steklova, 2015, Vol. 291, pp. 292–311.